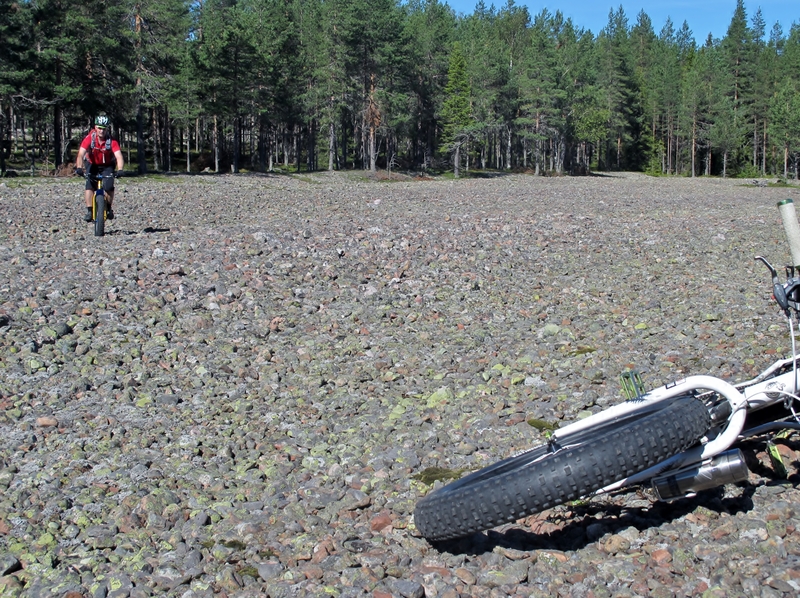 Once again my dear fat bike friend Kevin spend his vacation with us in Swedish Lapland. Kevin is joining us in Björkliden for the Bike summit but first he is going to explore Norway for a few days. 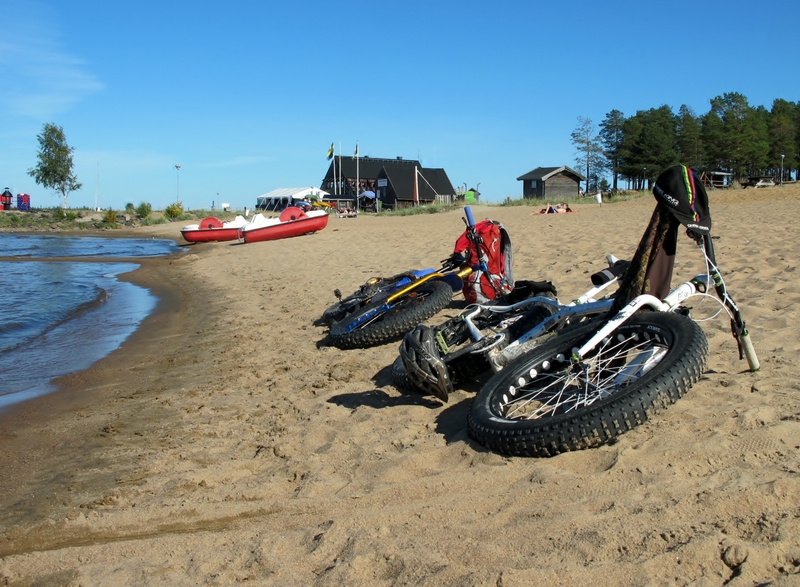 Since he flies from Manchester to Luleå he stayed an extra day in Luleå for some sweet beach riding on one of our bigger islands. Sandön is located just out side Luleå, just a narrow canal separates it from the main land. We borrowed a little dingy for transport across. Had to go two rounds to get over two Mukluks with riders. Finally over, we ride about one kilometer of gravel road until we hit the trail to the south side of the island. On the way we cross a huge boulder field. It sweeps through the forest in waves made of old sea bed created thousands of years ago. Crossing the boulder are no match for the fat bikes. A couple more kilometers through the forest and it is time to hit the shores. It has been quite a crappy summer this year but the last few days has been amazing. The water level has dropped and temperature has gone up to about 25 degrees Celsius. Before heading out it´s time do adjust tire pressure to softer conditions. Riding here is really amazing. Even if the water level isn’t quite as low as last year. Sometimes we had to run across shallow water. This is one of the best things you can do on a fat bike. When we´re getting further out on the outside all the boulders are gone. Landscape changes from moon-like to desert-like. Kevin, who lives in the Lake District is still amazed that we do not have any tide. The shoreline just looks like this. Always, depending on water level. Soon we reach another canal and we follow the shore and ends up at Klubbviken. A bath resort accessible by boat and ferry for the public. The restaurant is still open and we have classic fried Swedish herring (not the fermented one) with mashed potato and lingon berries. After coffee and rhubarb pie we get to borrow a sea chart to make plans for the winter. This one shows the snowmobile trails and what areas to avoid during winter when all of this get covered in thick ice. Then the archipelago will get even more accessible by fat bike. The plan is to bike-pack to Småskär 30 kilometers across the ice and do an over-nighter. Still winter is far away and it is time to take a swim by the beach. Mukluks gets to rest while we hit the waves. On the way back we take the north side. Along the shoreline there are loads of cabins and summer houses. We have to ride under several boardwalks and the vegetation is much closer to the water. Very different from the outside but still very beautiful. Far out to the left on this pic you can see the restaurant at Klubbviken. Since Kevin is from England he spotted an island and in traditional colonial manner claimed it for British territory. Well, i guess he can have it. It’s going to be hell on Isle Kevin during winter. Lol! Beaches finally ends and we head up on the forest trails again. This island just got it all. Lovely forest, shores, plains and on top of that a restaurant. To sum up the day. Kevins bike computer said 31 kilometers. We had an awesome lunch and a swim. This fat biking thing is pretty damn awesome. Thanks for a great day Kev. Always a pleasure to ride with you buddy. Great photos and perfect weather! Thanks! Yeah we got some super nice weather in the late summer. Love it!